Taking time to hire the right people for the right roles at your restaurant can save your team time, money, and prevent loss in the long run. Use the checklist below to make sure you’re implementing interviewing and hiring best practices. Tip: Consider having the candidate meet with several team members (including staff who have the same position) and perform customer service role plays during the interview. Conduct reference checks for all potential hires – especially if candidates have experience working for your brand. Conduct pre-employment background checks and drug screenings for manager hires. One third of new hires quit their job after about six months. And the cost of replacing a single employee is more than $3,000. This cost significantly impacts your bottom line – not to mention the time, energy, training, and operational loss that occurs as people learn new positions and make mistakes. By having a welcoming and impactful onboarding and training program, you can reduce turnover and ensure your team is well-trained and well-versed in company policies and procedures. The result? Less loss and employee error and happier employees and guests. Conduct orientation in small segments over several days so information can be more clearly understood and your new staff’s questions can be answered thoughtfully. Meet individually with team members to set your expectations and commitment to your company’s policies and procedures. Create a culture of coaching and accountability by providing specific, actionable feedback. Tip: Provide feedback in the moment. Don’t wait. If you see a teachable moment, say something immediately. This will help reduce future losses down the line. Mandate food safety training for all new staff – before they handle food. Tip: Double check your managers-in-charge have obtained or are in the process of obtaining their Food Safety Certification. Teach proper use and techniques of the portioning tools and provide feedback to new team members. Review the brand’s company cash and discounting policies. Have cashiers role play and use the practice mode on the register (if available). Tip: Only put new cashiers in position when they feel confident navigating the keyboard, handling cash and credit cards, and explaining menu items. Check in with cashiers to follow up on how they are doing and how they feel in the role. Cashiers scheduled for 8-hour shifts. Constantly keeping employees late. Too many hands in the till. These are all examples of restaurant scheduling fails that can lead to significant loss at your restaurant. Make sure your team is adhering to these scheduling best practices. Audit and edit the weekly schedule. Tip: Ask and answer: Did we meet our goals for the week? Is the restaurant team moving forward? What can we do to improve? Tip: Have a sales forecasting variance that’s less than 5% for a day or a week. Keep cashier shifts between 4 and 6 hours in length and schedule enough cashiers every day – a 6 to 8 daily minimum is a safe bet. This will keep your team fresh and less likely to make errors. It also isolates the time-frame and number of employees on duty, should loss occur. Schedule overlap for your cashiers to allow incoming and departing cashiers to count their till and begin or leave on time. This will make it easier to see if certain employees are stealing. According to the National Restaurant Association, internal employee theft is responsible for 75% of inventory shortages. Make sure you have the right systems and procedures in place by following the best practices below. Train your management team on inventory counting techniques and results to promote consistency. Tip: The morning manager should always review the previous day’s inventory counts first thing in the morning – at least 3 to 5 items. Track sales forecasting successes and have individual inventory targets for each restaurant (either in dollars or a percentage of sales). Tip: Keep your forecasting variance at less than 5% for a day or week period – no bouncing day to day or week to week. Conduct audits of the previous day’s ending inventory for accuracy (top 3 to 5 items). Utilize a sales forecasting tool box (a checklist of things to consider when forecasting – calendar, community calendar, marketing calendar, last year’s sales, trade area updates, construction updates, etc.). Schedule dedicated time (at least 30 minutes) to write your truck orders every week. Monitor product transfer, borrow, and loan processes. If you use a web-based reporting solution like Delaget Stats, review the transfer activity, transfer exception, and the inventory activity reports. Implement a check-and-balance system in place for every order. Have dedicated, trained staff to accept deliveries and verify their accuracy. Sequence inventory count sheet in order with storage areas, and coolers and freezers. Remove discontinued menu items from your count sheets. Use a system to track “inventory turns” or “days in inventory” to guard against inventory fraud. Tip: Pay close attention to your beverage and paper inventory. Too much product purchased in one period that is not used can inflate the profit/loss statement. Store extra uniforms in a secure location. Tip: Always receive uniforms from separated employees so that they aren’t stolen or misused. Plus, uniforms can be laundered and reissued, which will keep costs down. Create a policy and a location for storing and keeping employee bags and belongings while they are at work. 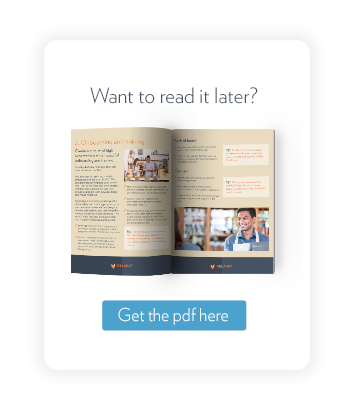 Open and clear communication among your staff is key to running a successful restaurant – and it can also help curb employee theft at your stores. When rules and procedures are clearly documented (and communicated) and when employees are coached and feel comfortable asking questions, you’re on your way to creating a positive store culture with less employee theft. Create a team communication center board that features the employee schedule, important loss prevention tips, and other important company updates. Use a communication log between managers to make sure no balls are being dropped and areas of concerns are clearly documented. Have pre-shift huddles every day and every shift to communicate service expectations to the team. Tip: During the huddles, highlight any promotions or contests you’re running, policy changes or planned enforcement, best practices and areas of concern, up-selling and menu knowledge suggestions, etc. Have regularly scheduled manager meetings. Tip: Make those meetings high impact! Discuss staff, sales, profits, and collect feedback from the team. Provide 1:1 coaching in the moment. If you see something, say something. Don’t wait for a loss to happen. QSRs make common robbery targets. They’re often open early and close late. Many stores are located right off the freeway, allowing easy getaway access. And every store has a safe filled with cash. Below are the best ways you can keep your restaurant safe and avoid costly surprises. Change your building’s locks following the termination of a manager. Keep all restaurant keys and swipe cards in a secured location, such as the safe. Keep all employment files in a locked box or cabinet with access only to the appropriate management. Have clearly defined employee entry (before open) and leaving (after close) procedures – and make sure they’re followed. Tip: For example, the opening manager should drive around the building before entering in the morning to identify potential forced entry and call the police, if necessary. Train your late-night drive thru team to lock the drive thru window between transactions and when walking away from the area. Conduct regularly scheduled loss prevention, safety, and human resource audits. The U.S. Chamber of Commerce reports that 75% of all employees will steal from their employer at least once. And the most common and costly type of theft is cash. At many restaurants, cash shortages are usually identified too late — when the money (and sometimes the employee) is already out the door. Plus, if proper cash handling processes aren’t followed, there’s no way to hold specific individuals accountable for the loss. From the drop box to the drive thru, use the best practices below to beef up your restaurant’s cash handling procedures. Utilize cash drop boxes near the register station. Know if cashiers deposit their own money, or witness the depositing of their own money into the safe. Discipline employees working on registers to which they’re not assigned. Mandate that cashiers count their till before and after their shift. Ensure validated deposit slips are audited against the expected deposit amount. Make sure your register fund is large enough so that you don’t need to fetch change during peak periods or make change between registers. Monitor the cash paid/out voucher system for theft opportunities (i.e., purchases outside the scope of the approved items). Utilize a drive thru timer and integrate it with the POS to compare transactions versus number of cars. Make sure the amount on the daily safe close tape is audited against the expected deposit. Only give your management team keys to the drop boxes. Give each manager separate alarm and safe codes. Ask managers to keep their keys on their person at all times. Control manager swipe cards to registers (if used). Change manager passcodes to the register per your company’s standards or when the codes are compromised. Utilize an armored car safe. Have stable cash over/short (no more than 25% of days with cash +/- >$5). Set challenging goals for POS metrics, including: deletions, voids, cancels, refunds, discounts, cash over/short. Tip: Look to your brand’s standards as well as past store performance to create challenging, but realistic, goals for your stores. Track cashiers’ POS performance. Using a web-based solution can help you easily access this data. Have a DVR system with coverage on the front doors, lobby, registers, safe area, parking lot, exterior drive-thru lane, and back door. Train your management team on how to use the DVR system. Clean camera lenses at least once a week. Schedule time to look at cashier performance every day. Tip: A web-based solution like Delaget Guard will pinpoint cashiers who are performing outside your brand’s standards and recommend action items to take. Conduct surprise cash audits to prevent suspicious trends at the register. Have counterfeit bill markers and use them for all $100 and $50 bills and questionable $10’s and $20’s. Tip: If you use a Smart Safe, feed the bills into the bill readers before serving the guest. Monitor cash in the till throughout shifts. Tip: Managers should pay close attention when a cashier’s drawer is open and should review DVR footage, if follow up is needed. Have a system to follow up on credit card charge backs. Tip: Typically, an accountant or bookkeeper is in charge of “owning” this process. If you outsource your accounting, ask your vendor to send a daily report charge back activity report. Audit the daily safe close tape against the expected deposit. Let’s talk! We can help you reduce your loss by 25-40%. Hungry for more loss prevention and operational best practices? Sign up for our blog now.